In this posting we will discuss about juices, milkshakes etc. Normally all fruits have juices but all juices cannot be used as drinks. Only certain fruits have good flavour and their juices are normally extracted for drinking purpose or jams, squashes etc. Let us see how we can make instant artificial juices in case suddenly someone visits us in hot summer without any notice. For this reason always I keep a stock of citric acid crystals readily available. 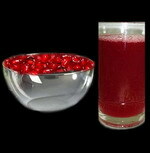 It is not only for making juices but also to adjust the deficiency in sour taste. You need to have stocks of peppermints/toffee/candy made from pine apple, straw berry, orange and lemon. Take at least 5 to 6 pieces for a small glass of juice and powder them. Add a little water, some sugar and a little citric acid crystals, if needed. Blend and then add ice cold water. Adjust the taste of sugar and citric acid. Instant pineapple, orange, strawberry or lemon juice is ready according to the peppermint/toffee/candy chosen. We can extract juices from fruits like orange, lemon, pine apple, water melon, pomegranate, mango, strawberry etc. In the case of mango, cut the fruit into big pieces after removing the skin and seed. Put these in a blender with a very little water and blend with sugar. Generally raw juice without any additives will be better and natural. Chill this before serving. Similarly, in the case of pineapple remove the skin, central stem and just take the slices only to blend. Add sugar and a very little water. For water melon just cut into pieces after removing the skin and deseeding. Then blend with sugar. Adjust the quantity of water as per the consistency required but do not add more water as it will bring down the natural taste. You may add a pinch of salt to enhance the taste. Extract the juices of orange, sweet lime/musambi or lemon manually after deseeding them using a juicer (manual styled reamer). In case there are a few people, you can use squeezer. Remember to extract lemon juice over a pinch of salt as otherwise it may taste bitter. In the case of pomegranate, grapes, strawberry and similar fruits with very small seeds, just blend, strain the juice to remove the seeds and fibres to get clear juice, add sugar, chill and serve. For this instant juice, you need to keep the sugar in powdered form so as to force it to dissolve immediately. meaning that you need to take for 1 part of juice three times the quantity of sugar. Add water just to dip the entire quantity of sugar and heat. After it dissolves and starts boiling, remove from the fire. Keep stirring to avoid charring. Allow to cool. When it is cooled, add the juice well with a pinch of sodium benzoate. Pour it in bottles leaving 1 inch head room for expansion, close tightly and refrigerate. For this we use mango, water melon, pomegranate, and straw berry juices. After extracting juice, we add thick chilled milk and sugar powder mix well and again chill before serving. You can top it with ice cream of vanilla or the concerned fruit. 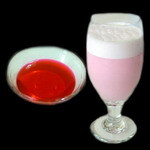 You can also add different fruit juices and milk to make cocktail fruits milkshake. Here ensure that the milk does not curdle by adding chilled milk slowly and mixing. Some people cut banana slices, blend them into a paste with milk and add a few drops of vanilla essence and sugar to taste to make banana milk shake. For this we need artificial milk essences which are available in reputed food stores. Heat fresh milk to boil and cool. Add the rose milk essence to it and also sugar powder. Mix well. Add the strawberry red colour and mix. Refrigerate and serve when chilled. If you want BAdAm Milk, PiStA Milk, Mango milk, chocolate milk etc, use the specific essence and prepare as above but the colour must vary. For BAdAm, add light yellow colour, for mango – deep yellowish orange colour, for PiStA – piStA green colour, for chocolate – light brown colour etc. First, you need to prepare rose syrup as follows and store in stock. Both the rose extract and rose water can be purchased from any reputed food store. Add 2 cups of water to the sugar and heat. Stir constantly to dissolve and boil. When the sugar is completely dissolved and boiling starts, allow boiling for 5 minutes and put off the fire. Cool the sugar syrup. Now add rose extract, rose water and the colour. Mix well and store in a bottle. Refrigerate. This is Rose syrup. To prepare natural rose milk, take thick milk, pre boiled and chilled and add sugar to it as well as the above syrup in the ratio of 1 glass of milk+2 tbs rose syrup or a little more+2 tsp powdered sugar or more as per taste. Shake well and if need be run in the blender, chill and serve. For this you need to soak 9 cleaned and fresh almonds for 3 glasses in hot water for half an hour, peel the skin and blend to a nearly fine paste but not very smooth and with a little coarseness like semolina. Blend this with thick milk and sugar powder. Add light yellow colour a little. Chill to serve. Proceed exactly as above taking at least a tablespoonful of pistachio for each glass. Here the piStA green colour is to be added. This entry was posted on June 25, 2012 at 2:23 pm and is filed under Miscellaneous Specials with tags almond, artificial fruit juice, badam, candy, fruit juices, grape, lemon, mango, mango milkshake, milk, musambi, orange, peppermint, pineapple, pista, pistachio, pomegranate, rose extract, rose milk, rose syrup, strawberry, sugar, sweet lime, toffee, water melon. You can follow any responses to this entry through the RSS 2.0 feed. Both comments and pings are currently closed.